If your computer is locked by the Everything on your computer has been fully encrypted Ransomware, and you are seeing a message like “Your computer has been blocked” or “All activities of this computer has been recorded. All your files are encrypted. 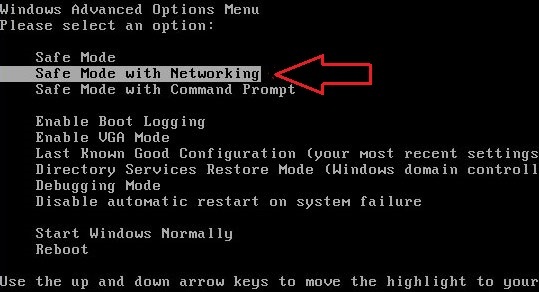 Don’t try to unlock your computer.” then your computer is infected with the Trojan:Win32/Harasom.A Ransomware. This ransomware Trojan:Win32/Harasom.A infection will also scan your computer for files that end with the .ddrw ,.pptm ,.dotm ,.xltx ,.text ,.docm ,.djvu ,.potx ,.jpeg ,.pptx ,.sldm ,.xlsm ,.sldx ,.xlsb ,.ppam ,.xlsx ,.ppsm ,.ppsx ,.docx ,.odp ,.eml ,.ods ,.dot ,.php ,.xla ,.pas ,.gif ,.mpg ,.ppt ,.bkf ,.sda ,.mdf ,.ico ,.dwg ,.mbx ,.sfx ,.mdb ,.zip ,.xlt extensions and then encrypt them. Emsisoft has developed decrypt_harasom.exe to decrypt the files they are encrypted by the Trojan:Win32/Harasom.A ransomware. Once the file has been downloaded, double-click on the decrypt_harasom.exe icon to start the program. If Windows Smart Screen issues an alert, please allow the program to run anyway. When the decrypt_harasom.exe starts you will be shown a screen showing all of the drives detected on your computer as seen in the image below. Click on the Decrypt button to start the decryption process. The Emsisoft Harasom Decrypter (decrypt_harasom.exe) will now scan your computer for variants of the Harasom ransomware infection and quarantine them. 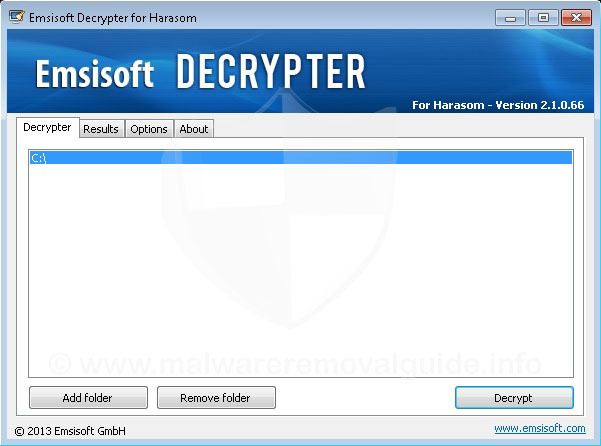 When the Harasom Decrypter detects any encrypted files it will decrypt them and save them in their original location. When it has finished, please check the results and then close the Harasom Decrypter (decrypt_harasom.exe). You can now check your files and if it opens properly, delete the encrypted files from your hard drive.